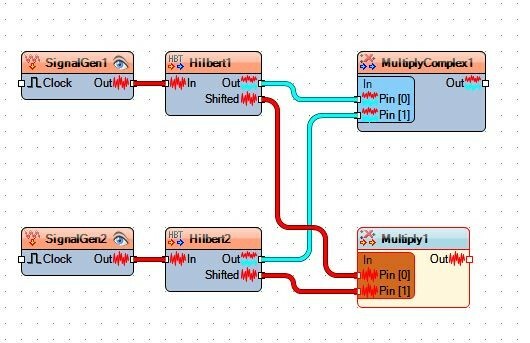 In this article, we’ll describe how to use a Hilbert transformer to make a phase shifter or frequency shifter. In either case, the input is a real signal and the output is a real signal. We’ll use some simple Matlab code to simulate these systems. After that, we’ll go into a little more detail on Hilbert transformer theory and design. A conceptual diagram of a phase shifter is shown in Figure 1, where the bold lines indicate complex signals. The input is cos(ωt+ϕ). As we’ll discuss later in this article, the Hilbert transformer [1,2] converts this input to a complex analytic signal ej(ωt+ϕ) = cos(ωt+ϕ) + jsin(ωt+ϕ). We multiply this signal by ejθ , where θ is the desired phase shift, to obtain the complex signal ej(ωt+ϕ+θ). The real part of this signal is our desired output: y= cos(ωt+ϕ+θ). 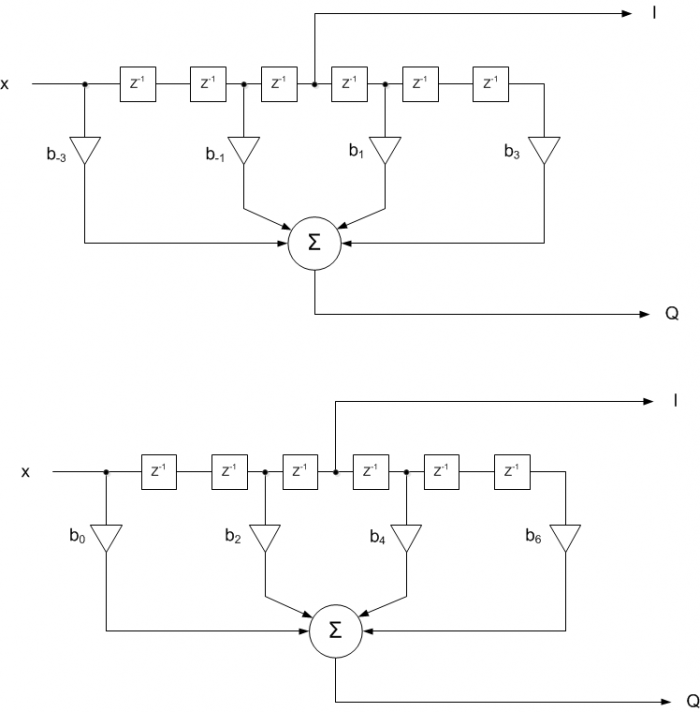 This allows us to implement the phase shifter using the block diagram of Figure 2. Note there is no “j” anywhere in Figure 2: all signals are real! In particular, the Q signal is a real number – in calculations we can use it to form the imaginary part of the complex signal I + jQ. As you probably know, I stands for In-phase component and Q stands for Quadrature component. I and Q are also frequently called xre and xim. Figure 2. Phase Shifter Implementation. The following Matlab code implements the block diagram of Figure 2. A 31-tap Hilbert transformer is realized as shown, where we take the theoretical coefficient values and multiply by a Hamming window to get the coefficients b1. We also create b2, which is a simple delay of 15 samples – this represents the delay of the center tap of the Hilbert transformer’s tapped delay network. Now apply input x to the Hilbert transformer. The I output is just the center tap of the filter’s tapped delay line. Figures 1 and 2 assume no phase shift in the I-channel output of the Hilbert transformer. However, the actual implementation has a delay of 15 samples. This means the phase shift of –π/3 occurs with respect to the Hilbert transformer’s I output (center tap of the delay network). Figure 3 plots 32 samples of y and I on the same graph. As desired, y lags I by π/3 radians. It’s worth noting that the phase shift does not depend on the frequency of the input sinusoid; as long as the frequency is within the passband of the Hilbert transformer, we get the desired phase shift. For example, Figure 4 shows a +π/4 phase shift for input signal frequencies of 6 Hz and 9 Hz. Figure 4.Phase Shifter I channel (blue) and output (green) for ϕ= + π/4, fs= 100 Hz. Top: f0= 6 Hz Bottom: f0 = 9 Hz. The frequency shifter block diagram is shown in Figure 5. It is the same as the phase shifter, except we let θ in Equation 1 equal dω*t, where dω (rad/s) is the desired frequency shift. The cos(dω*t) and sin(dω*t) signals are generated by an NCO. We assume the input x is band-limited, so that its spectrum falls within the passband of the Hilbert transformer. Figure 5. Frequency Shifter Implementation. Now we’ll develop some Matlab code to shift the frequency of an input signal centered at 12 Hz by +3 Hz. First, we modify the Hilbert transformer used previously by replacing the Hamming window with a Blackman window. Compared to the Hamming window, this gives a more accurate passband response, at the expense of response flatness at low frequency. We will also quantize the coefficients to 12 bits. Now we’ll generate the input signal x and apply it to the Hilbert transformer. Rather than using a sinusoid, we’ll use a modulated pulse with approximately rectangular spectrum. The Matlab function to generate the pulse is listed in the Appendix. Next we generate the NCO output and use it to shift the frequency. The modulus function is used to make the NCO’s phase accumulator roll-over when its value exceeds 1. These spectra are shown in Figure 6, where we have shifted the portion of the spectrum above fs/2 to the range –fs/2 to 0. 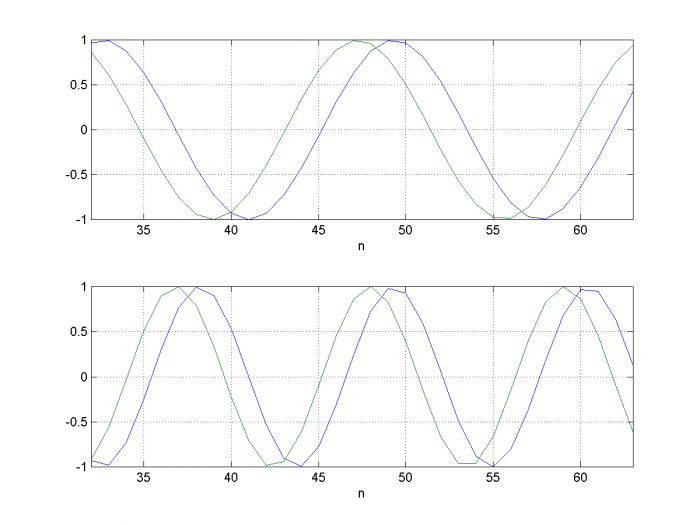 Figure 6a shows the spectrum of real input signal x, and Figure 6b shows that of the complex Hilbert output xc, which approximates an analytic signal. That is, it has negligible frequency components for f < 0. Figure 6c shows the spectrum of NCO signal exp(jθ), which is also analytic, having a single component at +3 Hz. Figure 6d shows the spectrum of the complex product. As you can see, the complex multiplication has shifted the center of xc from 12 Hz to 15 Hz. 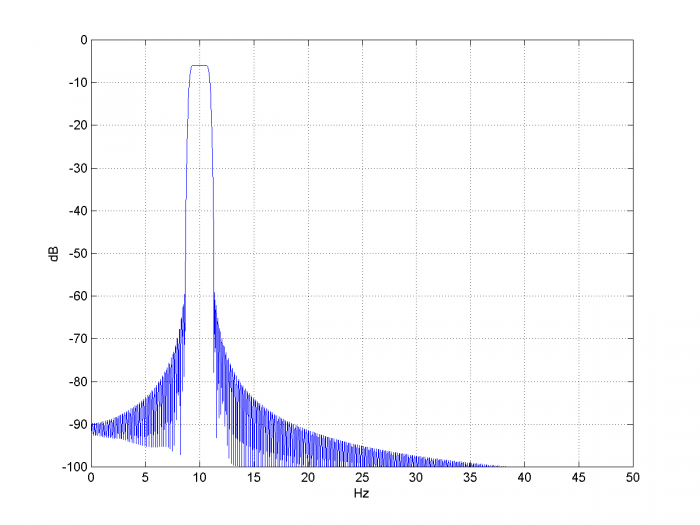 Finally, Figure 6e shows the spectrum of the real output y, centered at 15 Hz. Had we multiplied two real signals instead of complex signals, we would have gotten duplicate spectra centered at 9 and 15 Hz: not a useful result. This shows the power of using complex signals. Finally, note that we didn’t need to know the frequency of the input signal – the frequency shifter works on any signal in the Hilbert transformer’s passband. Figure 6. Spectra of signals within the frequency shifter. Now let’s examine the purity of the output spectrum. The spectra of the real input signal x and real output signal y are plotted in Figure 7. The sideband at 9 Hz is caused by the Hilbert Transformer not having perfect response magnitude of 1. This is due to the truncation of coefficients to 31 taps and quantization of the coefficients. While we’re looking at imperfections, we can also quantize the NCO phase and NCO output (LUT quantization). The following code quantizes these to 10 bits. The resulting output spectrum is shown in Figure 8. HT length= 31 taps, HT quantization= 12 bits, fs= 100 Hz. NCO phase quantization = 10bits, NCO LUT quantization= 10 bits. Here we’ll touch on the math behind the Hilbert transformer, and we’ll look at basics of how to implement one. A more detailed description of the theory of the Hilbert transformer is presented in references [1,2]. –N/2 : N/2-1, where N is even and N+1 is the number of taps. The taps can then be multiplied by a window function. A block diagram of a 7-tap Hilbert Transformer is shown in Figure 9 , where the top diagram numbers the taps according to Equation 3, and the bottom diagram renumbers them to start with b0. The I-channel is taken as the center tap of the delay network, which corresponds to t = 0 in the ideal Hilbert transformer. The Q-channel response of–j = e-jπ/2 gives a π/2 phase lag for a sinusoidal input. Thus, for I = cos(ωt), Q is sin(ωt). We can then define the complex signal I + jQ = cos(ωt) +jsin(ωt) = ejωt. Unlike the real input signal, this signal has no spectral component at -ω. 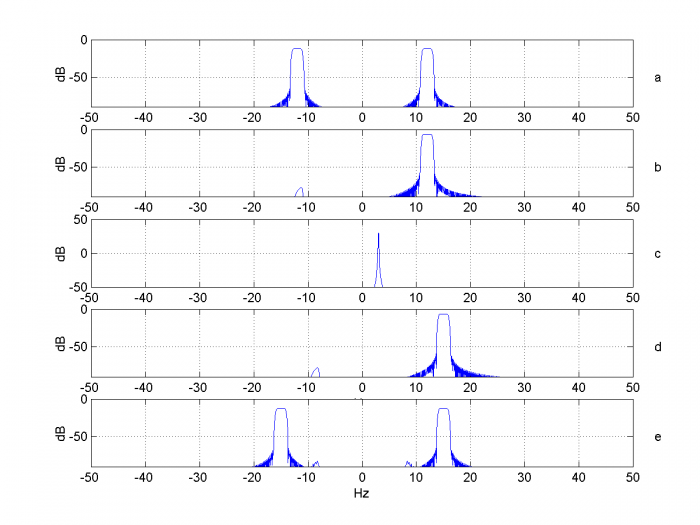 Signals with no spectral components for f < 0 are called analytic signals. In general, the output of the Hilbert transformer is analytic for input signals in its passband . For example, in the preceding section, the modulated pulse signal was transformed into an (approximately) analytic signal, with spectrum shown in Figure 6b. Figure 9. 7-tap Hilbert Transformer. Top: with taps numbered per Equation 3. Bottom: with taps re-numbered to start with b0. These coefficients are plotted in Figure 10. Now let’s compute frequency response. In making a realizable filter, we delayed the input by 15 samples to create the I channel. Thus we need to calculate the response with respect to this delayed version of the input. 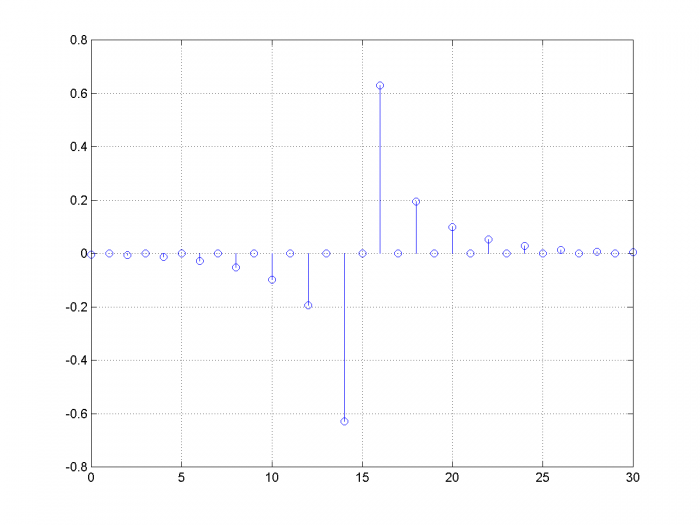 The Matlab code is listed below and the response is plotted in Figure 11. As you can see, the response is pure imaginary and deviates from Equation 2 at low frequencies and near fs/2. 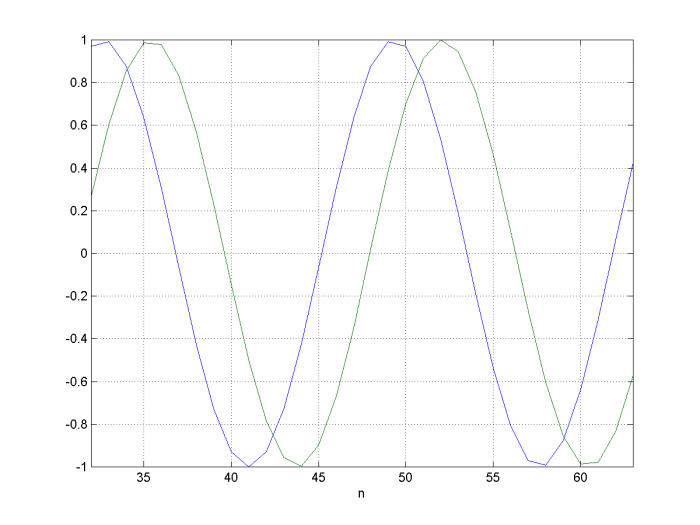 When using the Hilbert transformer, we need to make sure that the signal frequency is in the flat part of the response. Finally, regarding this window method of Hilbert transformer design: while straightforward, it is typically not the most efficient method. 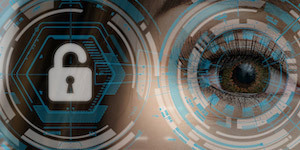 An efficient approach uses the Parks-McClellan equiripple FIR design algorithm, which is implemented by the Matlab function firpm . This function has a mode specifically for Hilbert transformer design. Figure 10. Coefficients of 31-tap Hilbert Transformer. 1. Mitra, Sanjit K., Digital Signal Processing, 2nd Ed., McGraw-Hill, 2001, section 11.7. 2. Lyons, Richard G., Understanding Digital Signal Processing, 2nd Ed., Pearson, 2004, Ch. 9. 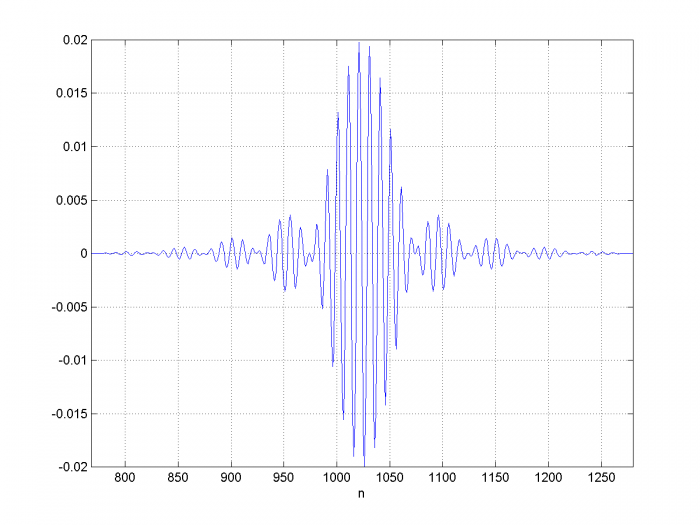 This function generates a modulated pulse having an approximately rectangular spectrum. The pulse envelope response is generated using a window-based FIR lowpass filter. An example pulse output is shown in Figure A.1, and its spectrum is shown in Figure A.2. % N = pulse length including padding, samples.N must be a multiple of 8.
fc= 10, bw= 2, N= 2048, fs= 100. 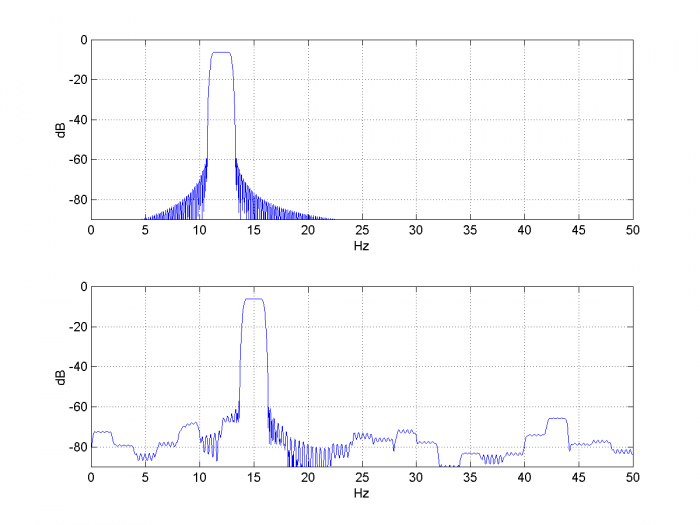 Figure A.2 Spectrum of modulated pulse. Hi Neil. Your blog presents nice, clearly described, examples of the utility of a Hilbert transformer. Yes, I have not looked closely at the effects of quantizing the NCO phase and LUT. I'll be interested to hear any insights you have. Note that the PDF file has an appendix B that contains the frequency shifter code (but does not include the five lines of code that perform the NCO quantization). to obtain the real result y? Can you unpack how you knew what the word "unpack" meant? I think this is one of those words that journalists use. As in "Can you unpack what he means by Democratic Socialism?" I can't recall when I first started hearing it, probably in the last decade or so ... or two decades or three. From Merriam-Webster definition, 3rd entry, "to analyze the nature of by examining in detail : explicate unpack a concept"
While I'm here, Neil, thanks for the great article. It cleared up a few things I hadn't thought of in a while. Rick, well, thanks for everything. I've read many of your articles and books. You're a great teacher! Hi @mpettigr1. "Unpack" huh? We learn something new every day! Thanks for your nice, and informative post! 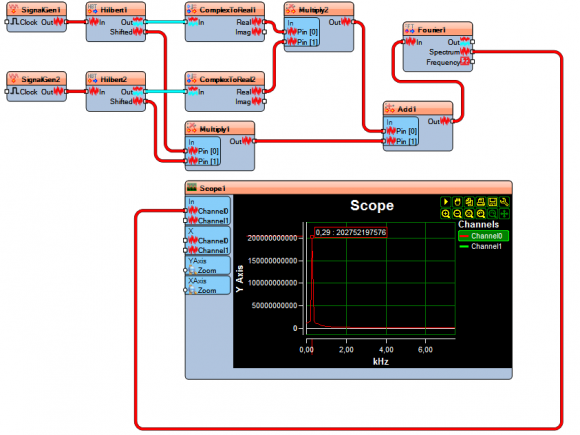 I'm trying to replicate frequency shift algorithm in OpenWire Studio by draging DSP components from palette. It look like I don't understood exacly how it works and need some help from specialist. Above diagram show how I start. Is it good start? I haven't idea how to finish. I will be appriciated for help (this task is to complicated to me as start with DSP). Based on this model I would like to prepare program in C++ Rad Studio. Sorry, I'm not familiar with OpenWire Studio. I'm guessing it would be easier (and safer) to manually convert the Matlab code in my post to C++. Let's consider that SignalGen1(500Hz) is the signal which I would like to shift and SignalGen2(100Hz) is the shifting signal. I would like shift SignalGen1 by 100Hz. I'm looking for methodology. I try to do Hilbert for SignalGen1 and SignalGen2. Then I multiplay Complex path of SignalGen1 by Complex path SignalGen2. I have done the same for real path. Am I'm right doing like that? I think your terminology is a little confused. There is a real path and an imaginary path (not real and complex). I call the real path "I" (for in-phase) and the imaginary path "Q" (for quadrature-phase). You need two real multipliers (no complex multiplier is used) and a summer, as shown in Figure 5 of the post. Also, it would be simpler to use an NCO with sine and cosine outputs instead of the real source SignalGen2 -- then you would only need one Hilbert Transformer. 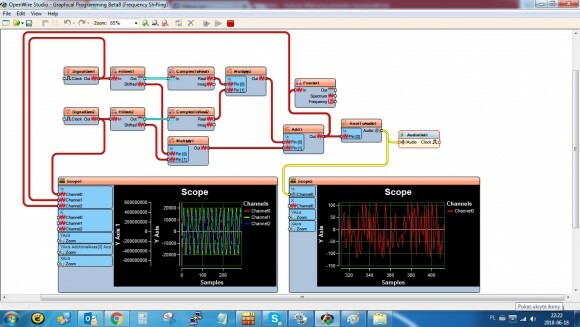 Dear Neil - your inspiration help me to finish and simulate block diagram in OpenWire Studio. 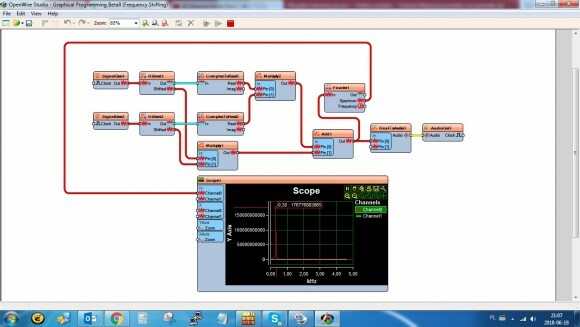 It's software which help to simulate working Delphi/C++ components in easy form by draging DSP components and wire connections. Great! One thing to be on the look-out for: The Hilbert transformer response should be flat at the input frequency. 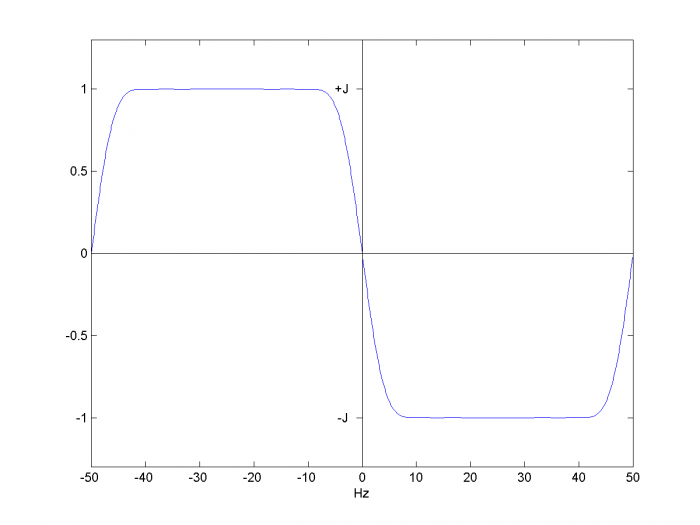 For example, in Figure 11, it is flat from 10 to 40 Hz (linear amplitude scale). I was to early happy. 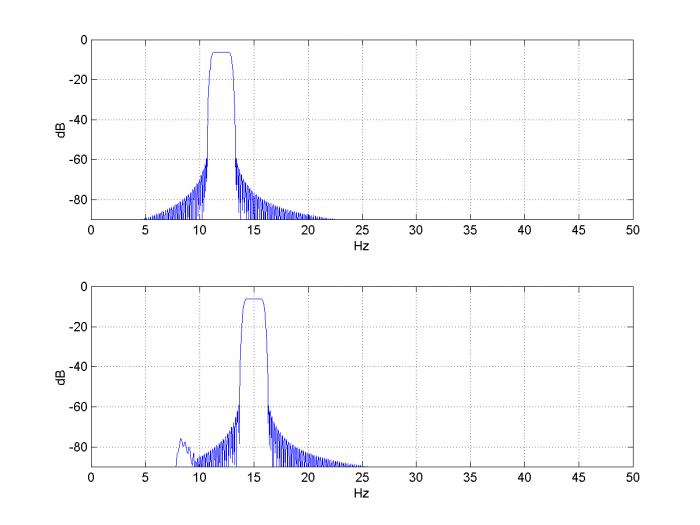 SignalGen1 is 500Hz and SignalGen2 is 200Hz (both sinusoid). When I do FFT and plot it on scope it's look like SignalGen1 is shifted 200Hz - so I was happy to achieve it - but when I listen output it sound like pink noise. Excellent! I guess you meant to say "output overflow" and not "output override".